Spooky Reads Week + FREE Books in October! To celebrate the spooky month of October I’m sharing dark excerpts from Imajin Books that are FREE this week on Kindle including A Hidden Element! FREE On Amazon Kindle 10/11 – 10/15. Paperback on Chapters/Indigo. In 2018, rookie detective Kate Garrett lives in the shadow of her near-legendary father Joe. When Joe dies unexpectedly, he leaves Kate half interest in Garrett Investigations, his last case that ties to three murders, a partner she can’t stand and a legacy to live up to. Jake Carmedy has lost a partner, mentor and friend, but grief will come later. First, he has a case to solve, one that has detoured from a simple insurance case to a murder investigation. If that isn’t enough, Joe’s daughter seems to want to take her father’s place as his boss. No matter how hard they try, Carmedy and Garrett can’t avoid each other-and they might be next on a killer’s list. The mark was fifty-two, but looked older. His pale face was a map of worry lines and a fixed frown. He wore one of those endurable overcoats and a matching hat, both advertised as ‘guaranteed to protect your clothes from anything nature or environmental pollution throws at you.’ It made the short, stocky man look like a walking tent. Joe knew the man’s routine, so he didn’t need to follow closely. Because of the rain, people made a beeline for covered walkways and underground tunnels connecting most of the buildings in the downtown core. Even the tree-lined main street was quiet enough that Joe could stay on the opposite side of the road and still keep his target in sight. When the man turned the corner toward the municipal parking garage, Joe quickened his pace. He jogged across the avenue, then resumed a leisurely pace. The man paused by a news box. Joe slowed. Don’t stop now. Don’t look around. A figure in generic, baggy black sweats, and an oversized hooded jacket stepped out from the shadow of an intersecting alley. The man Joe was tailing detoured across the garage exit and to the pedestrian entrance. Joe pulled an old-fashioned flip phone out of his pocket and answered it as if it had signalled. It looked like a digital camera phone, a piece of disposable technology that could be bought from most corner vending machines. Like the cigar, it was more than it seemed. The innocuous shell had a Nanotech audio-video recorder installed, which now homed in on the person in black. Making a quick check to see if the road was clear, Joe headed toward the same garage where a late-model hybrid was pulling out while its driver fiddled with his headset. The HUV braked, skidded on the wet pavement and stopped. The man’s white hair shone like a spotlight under the full moon. He raced around trees seeking her out. 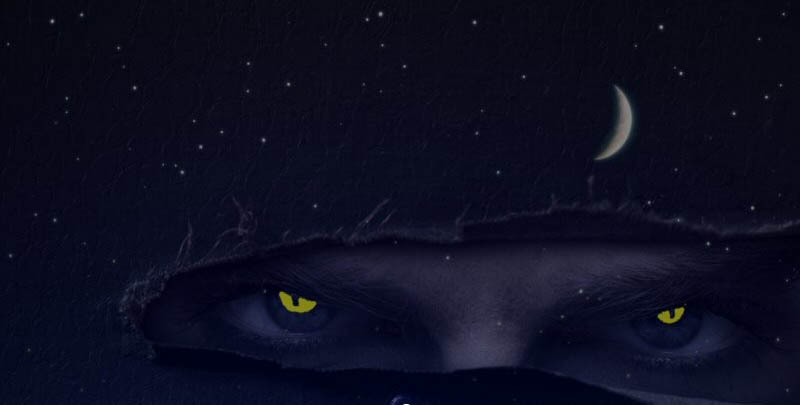 Once when she looked back his yellow eyes glowed with evil. He grinned at her, and in his grin she saw her death. His pale, naked body rippled with muscles as he moved in fluid motion toward her. He seemed to fly over the mossy forest floor, his feet never landing on earth. She ran faster but her clumsy pregnant body defied her. She stumbled and grabbed onto a tree. She was naked, too, and in her nakedness she felt a deep vulnerability and shame. The mountain trail zigzagged. The heavy growth grabbed at her, slowing her down. 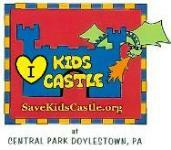 She plunged through a creek, slipping on rocks, and peered behind her when she reached the bank. He was gone. If—when—he caught her he would torture her slowly and rip her baby from her body. He would leave her here to die, with her child, in this wilderness. Pain sliced through her. Water gushed between her legs. The baby was coming. Here. Now. In this ancient, godless wood with the devil chasing her. She staggered up the bank seeking refuge. She doubled over and fell to her knees. There. A curved bush with a den inside. She crawled on pine needles to her sanctuary, scratching her knees and stomach. She fell on her side and curled up in pain. Daggers ripped through her. Charlie had come so fast. This one would, too. The pain subsided and she rolled onto her back, praying the killer stayed afar. Moonlight stabbed through the branches, exposing her. She pulled herself further into her wooded cave. A lone owl hooted above, announcing her hideaway. Laura darted her eyes back and forth from tree to tree, but the woods remained empty. Pain grabbed her harder, tightened across her belly like a giant fist pounding into her. She scrambled in the dirt for a twig, in between gasps and grunts. She bit down hard on a stick, swallowing sour grit. Pressure pushed all around. And such pain. She held her legs up, from underneath, widening the way for her child. She felt his head between her legs, pulsing to get out. Not here. Not now. Oh God, help me. Then a laugh cut across her hell. 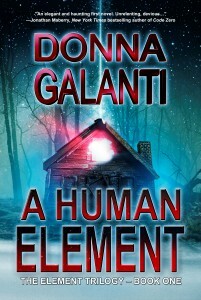 Donna Galanti is the author of the novels A Human Element and A Hidden Element of The Element Trilogy (Imajin Books) and the Joshua and The Lightning Road series (Month9Books). 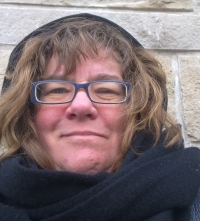 Donna is a contributing editor for International Thriller Writers the Big Thrill magazine and blogs with other middle grade authors at Project Middle Grade Mayhem. 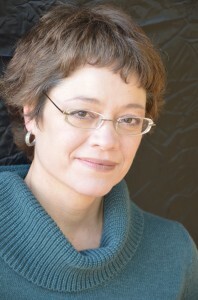 She’s lived from England as a child, to Hawaii as a U.S. Navy photographer, and has had a career in marketing communications. She lives in Pennsylvania with her family in an old farmhouse. 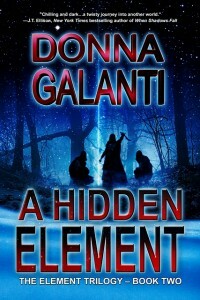 Visit her at www.elementtrilogy.com and www.donnagalanti.com. And ALL of these other Imajin Books are FREE in October, on different days. 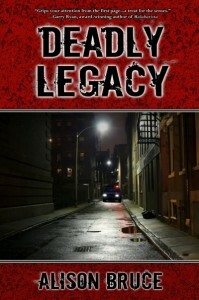 Love mystery, thrillers, and suspense? Then check them out!